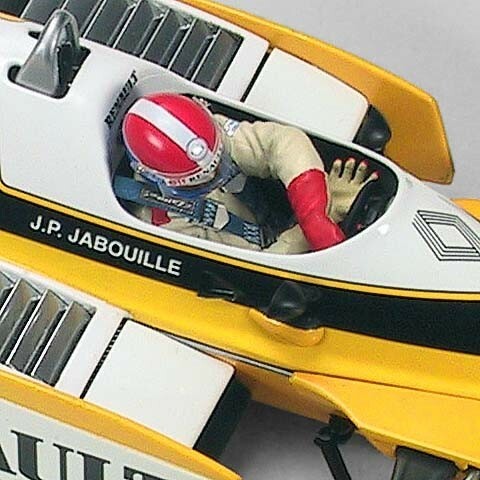 "Thanks for all the great models..."
Jean-Pierre Jabouille was nearing the end of his Formula One career in 1980, but the popular French driver had paid his dues to the national team, Renault. After enduring the company's debut World Championship season in 1977, with a car of singular power, Jabouille helped develop reliability of the ground-breaking Renault-Gordini 1.5 litre twin-turbo V6. An evolution of this engine powered Renault's 1980 RE-20, liveried in bright yellow and white and sponsored by Elf. In 1979 Jabouille brought Renault its first victory of the modern era, along with four pole positions, raising expectations for championship contention in 1980. Although he attained two pole positions in 1980, Jabouille's only win of the season came at Osterreichring, the race later famous as the debut of Lotus driver Nigel Mansell. In high altitude the Renaults had a natural advantage, and Jabouille qualified second behind his teammate, Rene Arnoux. Behind them on the grid were the Williams-Cosworths and the Ligiers. At the start Alan Jones pressed his Williams past Jabouille and Arnoux for the lead. By the third lap it was clear that the Renaults' power superiority remained. On the fourth lap the order reversed, Arnoux leading from Jabouille and Jones. As dicing continued behind them, the Renault drivers drove away only to find that pit stops dropped Arnoux into 10th place, and gave Jabouille the lead. As the race waned, Jabouille developed tire problems but handled the car skillfully to take victory by one second over Alan Jones.